My Very First Blog: Wat Ratchabophit : One Of The Most Beautiful Temples In Bangkok! Wat Ratchabophit : One Of The Most Beautiful Temples In Bangkok! 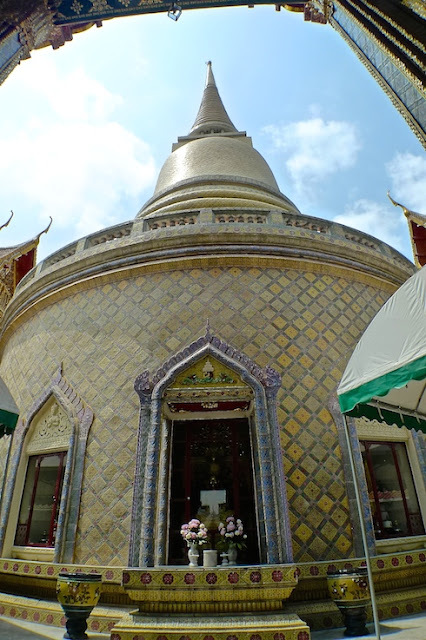 Almost anyone who goes to Bangkok would have visited or at least heard of famous temples like Wat Arun and Wat Pho, but many would probably not heard of Wat Ratchabophit. So during my third day in Bangkok, my friend and I decided to visit this less famous but no less amazing Wat. After a good breakfast at our hotel, we walked to the nearest BTS Skytrain which is the Surasak Station. I noticed that the famous Blue Elephant Restaurant is just walking distance to the BTS station. I have never dined at this restaurant before - maybe I should try it one day! I also noticed that Eastin Grand Hotel has direct covered walkway to the BTS Station, so if you don't mind paying more for accommodation, this hotel sure looks very convenient! We took the BTS Skytrain to Saphan Taksin Station where we alighted to take a boat at the Sathorn Pier to Tha Tien Pier. From Tha Tien Pier we walked past Wat Pho and followed the map to cross a canal to reach Astadang Road. Wat Ratchabophit is located somewhere there. The walk from the pier to the temple was about 25 minutes. Seeing barbed wires on the road reminded us of the political rally happening in Bangkok at that time. Luckily the place was safe and we did not encounter any problems. 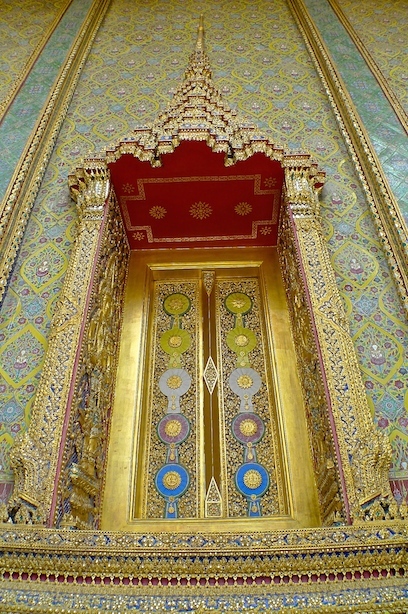 The first thing I noticed about Wat Ratchabophit was the door. There were two guards or watchmen on the door. 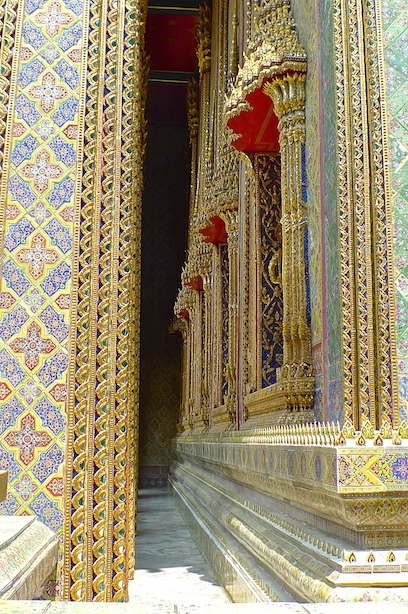 This door to this part of the temple was closed. Later I found out this door led to the Royal Cemetery. We went over to search for the main entrance. We found the main door opened with the guards in blue uniform welcoming us. I could not help examining the guards up close. They were pretty special, although maybe a tad eerie. 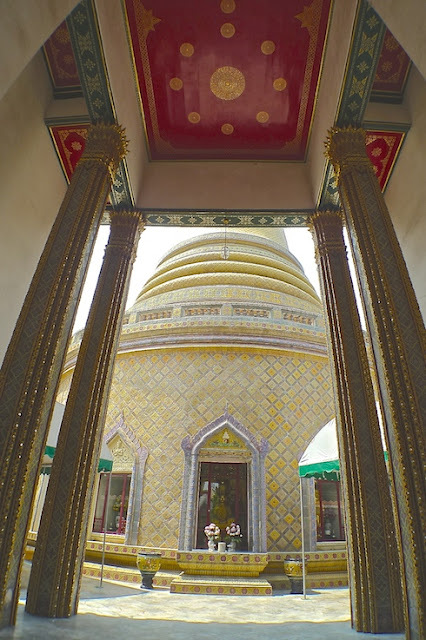 I have never seen any temples in Bangkok with uniformed guards in 3D standing at the door! After walking past the guards, we saw this beautiful structure in front of us. Behind this structure is a circular building. Two elephant statues guarding the entrance. 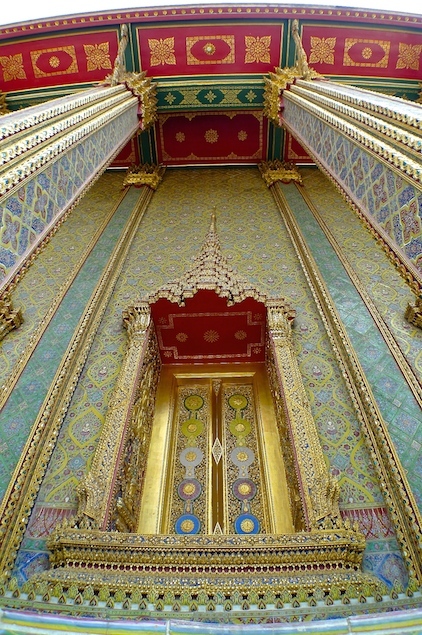 Hand painted glazed tiles and mirrors made the temple looked so beautiful! Closer shot of the exterior wall. So, so pretty. I could not help admiring them again and again. Wat Ratchabophit is a Buddhist temple built during the reign of Rama V in the late 19th century. It has an unusual design in which the wiharn (prayer hall) and ubosot (ordination hall) are linked by a circular courtyard. 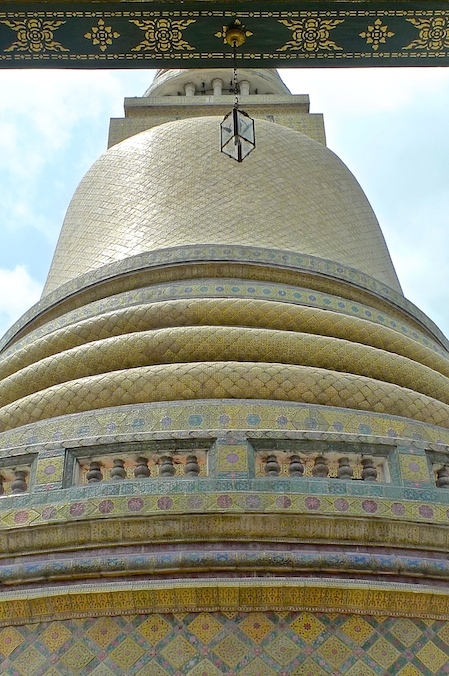 In the middle of the courtyard between the wiharn and ubosot stands a large gilded chedi (pagoda). I felt a sense of calm walking along the circular building. Look at those colourful images on the wall! You can see the chedi rising above the circular courtyard from here. Very clean and very quiet. I like it very much as there were not many visitors to this temple. Forgive me, but I needed to take one more shot even though they were similar looking. LOL. 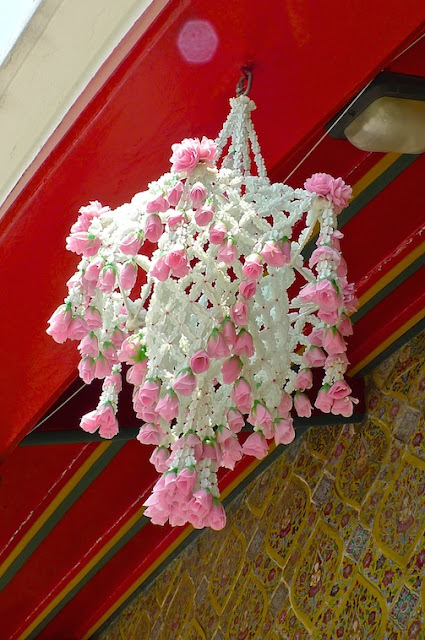 The beautiful flower decoration hanging on the ceiling. Excuse me, but I needed to take a closer shot. Haha. Oh my, will I ever stop admiring the exterior walls? Oh my God, this is awesome. Clearly, one of the most beautiful temples I have ever seen in the whole of Bangkok! 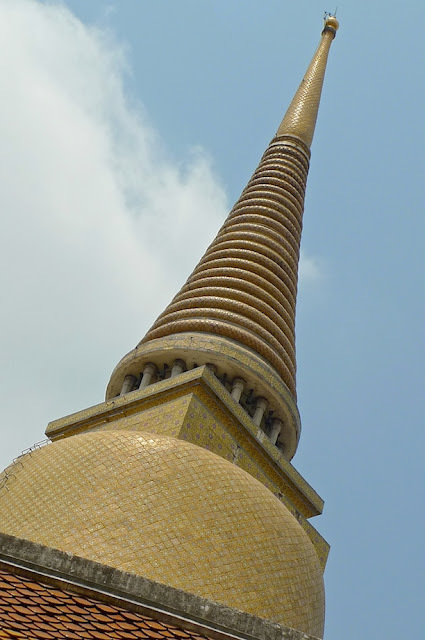 How come Wat Pho and Wat Arun are more popular? I think this is the door that leads to the ubosot. But it's closed during the time of our visit. What a shame! I heard that the ubosot looks like a Roman catholic church inside! Apparently, Rama V was influenced by European architecture. More shots of the intricate patterns and designs on the ceiling. Sorry, but I just had to take another picture of the door again. LOL. The tall chedi in the middle of the courtyard. The chedi as seen from outside the courtyard. Oh wait, did I show a similar picture earlier? LOL. Approaching the inner circular courtyard, where the chedi stands in the middle. Patterns and art work on the ceiling. The chedi rising above us. We were in the courtyard, in between the chedi and the circular building. A few different shots of the chedi. The building below the chedi. OK, one last shot before I call it quits. LOL. We were back at the front again with the elephants. It was time to leave. Wat Ratchabophit is such an amazing temple! I highly recommend a visit. I might even come here again just to try my luck in entering the ubosot. But the best thing about this Wat must be the lack of crowd and tourists. I hope it will stay that way for a long time!